On Saturday, Joe and Jack ran the half marathon in Nashville. Here they are looking exhausted, but pleased. Jack had the forethought to get some custom t-shirts made. Joe said he saw several Christians running this race and so there were lots of Bible verse clad backs to read. Dan holds out a packet of Power Gel... it not only sounds gross, but none of the guys liked it. Too sticky and sweet they said. So to make up for the disagreeable snack, we went to Cracker Barrel for lunch. Jack had meatloaf. Joe had blueberry pancakes. I'm a big fan of Cracker Barrel's catfish. In Taiwan we had geckos and japaluras. In kentucky we've got the wonderfully shy and squiggly skink. I've been trying to get a picture of one of these creatures for over a year now. My photo doesn't show it well, but he's got an irredescent blue-green tail. I know this photo seems a little incongruent with my post title, but bare with me. The omlette was my attempt to use some of the very large package of mushrooms I bought to make chicken marsala... My cousin Rich, who tackles much more complex dishes than I, gave me the recipe last month and I've dreamed of making it ever since. So why the long string of tortilla chips, pizzas, toaster oven s'mores and other less sopisticated endeavors? Well because I couldn't find the Marsala wine. Or the chicken! Apparently Kroger chicken truck drivers were on strike last week. So there were some whole fryers and some livers, but no boneless skinless breasts. And you'd have to be crazy to think I was going to buy a whole chicken and deal with all that chicken crud getting stuck under my fingernails to extract just two puny pieces of meat. After the lady at the checkout counter assured me there was no telling when the chicken truck drivers would resume their much needed role in society, I decided to find another grocery store. I'd never been in a Save-A-Lot before... There was sort of a Sam's Club-unfinishedness to the store, but instead of high ceilings and shelves, the aisles were cramped and crooked. The produce section seemed promising, with cheaper cilantro and tomatillos than elsewhere. But the rest of the store was a dearth of fresh foods. Everything was packaged, uber-processed and completely unhealthy. Save-A-Lot never sells boneless skinless chicken breasts. I stumbled across this story: Oregon governor starts week on food stamps (click here to read it) To summarize, a politician had a really hard time buying a week's worth of groceries with 21 dollars. He ends up living off of Cup Noodles and other demoralizing dorm-style foods. It made me feel sad that unhealthy foods are often the most economical in the short run... but people who are forced to chose ultra processed foods pay a big price for health problems in the long run. Anyway. How did I get here from chicken marsala? One of the magical places of my childhood was a hole-in-the-wall grocery in Chicago’s Chinatown. While my mom and aunt scouted out the deals, I lingered in the center aisle filled with whimsically designed packages of Asian snacks. Chinese snacks offer a variety of flavors and textures absent from American snacks. Seafood like squid and shrimp, or root vegetables like yams and taro, are popular in salty snacks. 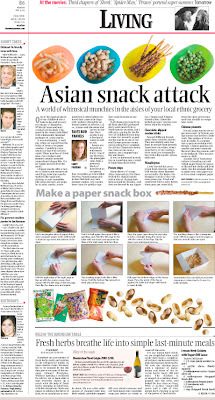 Asian junk food is often lighter textured than American chips and crackers (though by no means lighter in calories.) Also, Asians seek the sweet and savory in one bite. Most products get a dusting of sugar as well as salt. Sweets are dressed up with exotic fruits. One of my favorites, the pineapple cake, folds a generous block of dried fruit into a pastry that resembles an overstuffed Newton. Pureed mango and lychee find their way into gummy candies. My cousins were crazy for gelatin cups that could be eaten in one slurp. Such fantastical snacks in all their playfully packaged glory seem more fit for a child than for an adult. But I still get a craving for the flavors of childhood from time to time. So I recently scoped out the snacks at one of several Korean grocery stores surrounding Fort Campbell. Not all my Chinatown memories were on the store’s shelves, but I snapped up a few purchases. Many flavors of crispy chips come and go. But these French fry-shaped snacks with a hint of shrimp have been around for decades. And they are favored by my Japanese, Chinese and Filipino friends alike. I liked the kicked-up spicy version even better than the original. Several different brands make these crunchy snacks. They are slightly salty, but finer in texture than pretzels. Some have chocolate, others strawberry or nut coatings. Most come in a rectangular box with a flip-top lid. All are addictive. Look beyond the grass-green food coloring, and you will realize these legumes are actually chickpeas, the bumpier cousin to the common green pea. Fried and smattered with a salty batter, these peas get some kick from the spicy green mustard that usually accompanies sushi. Not all Asian snacks are super-processed. In Taiwan, eating snacks that involve a little work, like wedges of fruit or nuts in shells, is a popular way to pass an evening with friends. Chinese peanuts are smaller and more intensely flavored than the peanuts sold at the ballpark. They are also easier to shell. Another bit of Taiwanese culture is handing out individual paper boxes for guests to discard nut shells and fruit rinds. See the example below to make your own paper boxes from used computer paper. Emily Parrino is a New Era copy editor. She can be reached at 887-3298 or eparrino@kentuckynewera.com. Last night Joe and I drove through the most idyllic country south of Clarksville, Tenn., on our way to Emily and Rob Stahl's new home for Game Night 3. We didn't really get to the games, but we had some good eating and enjoyed the critters. (see previous posts) For more photos, click here. So I usually don't prepare a new experiment for friends (I usually reserve those creative and often inedible bursts for Joe) But I decided that instead of running out to buy some expensive Terra Chips to serve with the white bean and caramelized onion dip I learned how to make at the superfoods class, I would make my own flour tortilla chips. Happily, it worked. Torri's up to mischief. Twister is provoked. Lucy is unaware. Torri pretends not to notice that he's the center of attention. Today Joe made lunch for me and for our coworker Alex and his girlfriend Sara. We had crusty bread, cavatapi with marinara and meatballs and a salad. He made the whole meal all by himself :-), using his mom's meatball recipe, of course. Preheat oven to 350. Sprinkle meat with garlic salt. Add bread crumbs mixed with cheese and seasonings. Sprinkle a few drops of water on mixture, add beaten eggs. Mix thoroughly. Form into balls. Bake on cookie sheet 15-20 minutes. Drain on paper towels. Simmer in sauce at least 30 minutes, stirring occasionally. We were thinking to eat dinner at Cracker Barrel after we got back into Nashville last night, but then we spotted this quiet little Thai place. I was a little leary. Only a few cars in the parking lot. Dimly lit. And... the building was connected to a go-cart track. But when we got out of the car, my nose told me it was going to be good. Joe ordered beef chow fun (I know, sounds cantonese. But it was thai style) and I had the Thai Pacific noodles with mixed veggies. The menu said it was the most exotic noodle dish. I think they just didn't know what else to write, because it seemed pretty much like stir fried Shanghai noodles to me... but it was tasty. The atmosphere was also nice, but dark. I took this photo by placing my camera on the window ledge behind me and using my remote control and a several-second long shutter speed. Will someone please invent a tripod that lets you pivot your camera 360 degrees so I can take better restaurant food shots? was a very long day for me. I didn't sleep well in anticipation of the day ahead. Got out of bed at 5:30 and went to work at 6:30. All day, I had the most awful case of heartburn-- something I've only had maybe 2 other times. I got out of work a little before noon, then rushed home to tie up loose ends before driving to Nashville, where I eventually caught my plane. That flight was delayed several times. I was anxious to get up in the air because I had a connecting flight out of La Guardia, and the last thing I wanted was to be stuck in New York all night. My stomach was growling, but I was scared to eat. American Airlines no longer gives any kind of food... not even pretzels. So by the time I got to New York I was ravenous. Nashville had a BBQ place and fast food. But New York had a kiosk with deli wraps and pad thai and vegan sandwiches. Despite the heartburn, I bought an Italian wrap. Though I had to exfoliate the dried out first layer of tortilla, this thing was pretty darn good. And even though it had tomatoes, roasted red pepper, pastrami, lettuce and provolone... my heartburn went away. How does that work? Joe and I adored this little won ton shop down a nearby alley from our apartment in Taipei. Mmmm. The people who worked there knew us well. Growing up, with regular visits to my Chinese grandma's house in Chicago, I always thought won tons belonged only in a hot, clear-brothed soup with a few leaves of bok choi, some slivers of bamboo and maybe a shitake or two. In Taipei, I learned the joy of eating dumplings "dry" as they said, over a bed of lettuce or bean sprouts with a little spoonful of beef stew on top. At home in America, I recommend serving won tons --or anything in the dumpling-potsticker family-- with spicy dumpling sauce from wei chaun. It comes in a squarish glass bottle with a red cap. Most of the label is in chinese. Finely chop and pan fry the veggies in a little oil, then stir them into the meat. Dump soy sauce, oyster sauce, a little vinegar, garlic salt and pepper into the mix at your discretion. :-) I'm very sorry for the ambiguity of all my recipes. I don't like to measure. Keep a stack of won ton wrappers covered by a damp towel. Wet two adjacent sides of the a wrapper, spoon a smaller than seems necessary bit of meat into the center and press shut, squishing out any air bubbles before fully sealing. Then take the ends of the triangle and fold them upwards and pinch together like a big tortellini. Drop about 10-15 into boiling water at a time and remove after about 5 to 10 minutes. (again, I'm not really sure about the specifics. They'll float and look all shrively when they're done). Our husbands were at the men's Bible study, so I had Shirley, Jennifer and Deona over for tortilla pizzas (sorry no pics of this). The guys were also planning a camping trip sans wives for the weekend and so I thought I would make s'mores as dessert. I do not have a wood burning stove, a fireplace or a gas range. Nor fire pit outside. Nor large enough candles to get the true campfire effect of a roasted marshmallow. I've found that nuking an open-faced s'more for about 6 seconds gets everything hot and gooey, but doesn't add the burnt flavor. Sticking a marshmallow on a graham in the broiler of my toaster oven, and watching it vigilantly, makes for a good flavor, but the cracker might get a little scorched. Any tips? As a lot of you know, Joe and I don't have any family here in Kentucky. The Parrinos and Giammos are all in Cleveland and North Carolina. The Tilsches and Wongs are in Illinois, Minnesota (Aunt Susan, Uncle Greg, have you moved yet? ), Arizona and Afghanistan. Big family gatherings are few and far between for Joe and I. So it was really sweet when Brendan and Jennifer Couchman invited us over for Easter dinner with their families. :-) The house was filled with foods, kids and good fellowship. Many of my friends and coworkers in Hoptown have heard me talk about the field by our house, and how there is often a kitty sitting in it when we drive by on our way to work. This black cat is there so often, we began to suspect he's a ferral cat, living in the grassy open space bordered by Old Clarksville Pike and Hammond Drive. Yesterday as we drove home from work with a trunk-load of groceries, I saw him slinking up from the tributary to Little River. Joe said he'd take me back after we unloaded. It has been bitterly cold here the last 3 days. There was even a dusting of snow yesterday afternoon. The wind has also been strong, and whipping through the tall grass, Field Kitty didn't hear me approaching him. His eyes, half closed because of the breeze, were tracing the flight of some redwing blackbirds. I got very close before he turned his head in surprise. I snapped one photo before he bounded away like a puma. My regret: I wasn't fast enought to take a little video of him. He was truly athletic! While Joe was in Cleveland this weekend I bummed some meals and movies off the Martins. Shirley made garlic bread and spaghetti, Jeremy made some very lime-y salsa. I don't know if you can tell from my photo, but the noodles were hollow and had little ridges in them. It made fork-swirling the noodles more of a challenge, but they had a nice chewy texture compared to their solid counterparts. Joe likes wagon wheels, farfalle and penne. I've always been a fan of the more complex pasta shapes. Radiatorres and Cavatappi and Gemeli are my current favorites. As we drove home, we tried to imagine some new pasta shapes. What about a snail shell or some kind of coil? Honey comb? Bugles? Chex shaped?